Following approximately in the footsteps of William the Conquerer in 1066, Beard Team USA recently conquered England. 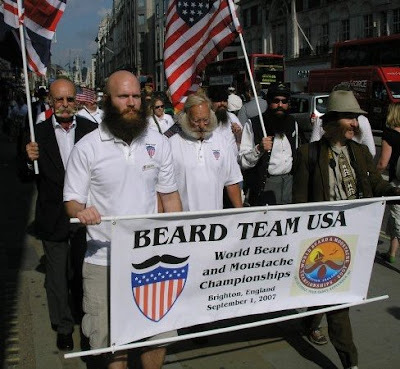 Here team members are seen headed for Trafalgar Square, the very center of London (and therefore in some people's mind the center of the world) for the HUGE Beard Team USA pep rally on August 29. Hey Phil, the BTUSA Blog header states that the next Worlds take place on May 23, 2008. Is it supposed to be 2009? We're all in India training with an IT company and decided that we needed to grow moustaches like our Indian coworkers. I never understood that there where a blog for beards. Now that is some seriously powerful beardwork! Rickey commends your beard-growing abilities!